You are here: Home / Blog / Tomorrow night’s the night! As you can see, all you need to do is bring your iPod loaded with a 15-minute Playlist or, alternatively, a smiley face. If you live south of the river (Thames, not Potomac), then please do come down, because it promises to be a really fun night. Especially when I play Steve Winwood. Can we have a MP3 night too, as I can’t afford an iPod. And there’s nothing wrong with Steve Windwood.. 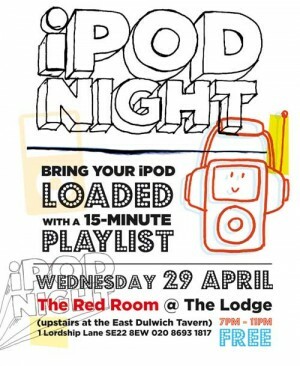 If you can’t afford an iPod, can I suggest hosting an iPod night to raise funds to buy you one? Or alternatively: syphoning off some of that charity money you’ll be raising, running the marathon. They’ll never miss fifty quid.